Beach Lane Books, 9781481430753, 40pp. Welcome to Bark Park! There are dogs running and dogs relaxing, dogs riding and dogs sliding, dogs with a buddy and dogs getting muddy—all before returning home to bubble bath, a cozy dog bed, and sweet dreams of—what else?—being back at the park. Bark! Bark Bark! Trudy Krisher lives in Dayton, Ohio, where she is a Professor at Sinclair Community College. She is the author of several young adult novels as well as Kathy’s Hats: A Story of Hope and Bark Park. Visit her at TrudyKrisherAuthor.com. A dog’s-eye view of a trip to a park. Whether walking alongside a child in a stroller, sitting with their owner on a blanket, going down the slide with the children, or just running around playing with their canine friends, these pups are truly enjoying being outside. The pages depicts a variety of families with their pets engaged in many outdoor activities. The pen-and-ink, watercolor, and colored pencil illustrations capture a wide array of breeds and types of dogs. The rhyming text is limited to a sentence or two per page. After a day of sunshine and frolic, “Dogs take a drink. Dogs yawn and blink. Dogs in a heap. Dogs go to sleep...and dream in the dark...Park! Park! 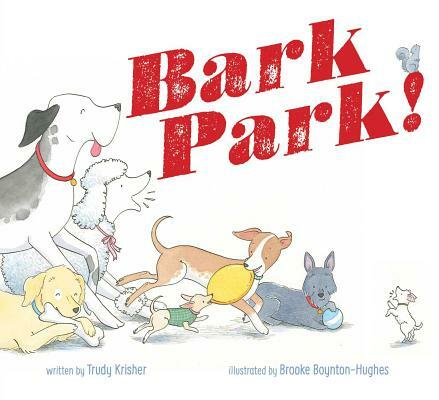 Park!” VERDICT An upbeat and exuberant read-aloud for dog lovers everywhere. Great for one-on-one, storytime, or class visit to the library.